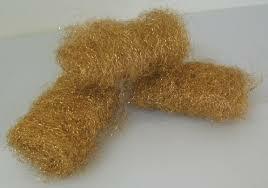 Bronze wool is a very versatile material and can be used for a variety of household, remodeling and construction tasks. Homax Bronze Wool Pads (3-Pack) is made of uniform, high quality bronze strands. Use it to polish, smooth, sand and strip wood and metal surfaces, such as stainless steel. Homax Bronze Wool Pads resist corrosion, rust and shedding. Great for household, marine and industrial use.